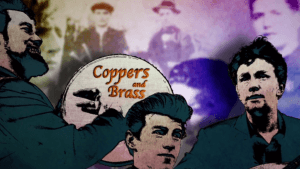 This is the first episode of season one of DCTV’s traditional Irish music series called “Coppers and Brass”. The series focuses on alternative viewpoints within the traditional Irish music community, looks at the contributions certain families have made and analyses how Irish Travellers have made a very significant contribution to the development of Irish traditional music. Presented by Tommy Fegan, this series explores the reality of the world of trad in Ireland and abroad. In this episode we look at Irish Traveller culture featuring insightful interviews with Martin Collins, Co-Director of Pavee Point, Michael McDonagh and a performance from the Cobblestone Pub with Seán Gilrane & Davy Sheridan.